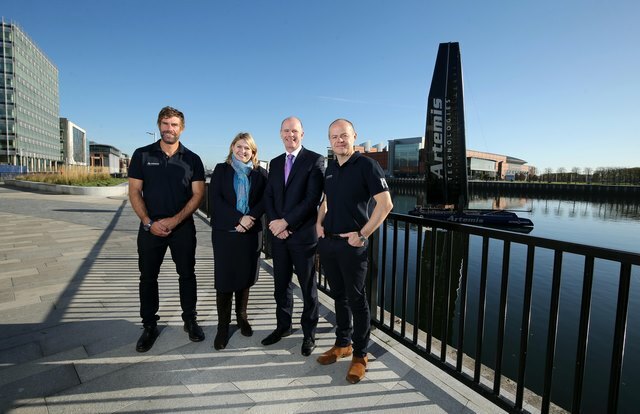 Artemis Technologies, a spin-off from America’s Cup team Artemis Racing, is to establish a new facility in Belfast Harbour, initially creating 35 jobs, in a bid to return commercial shipbuilding to the city. The ASV will be a zero-emissions 45 metre catamaran, that will require no fossil fuels, offer unlimited range, and has the potential to travel at 50 knots, with a cruising speed of 30 knots in any condition. Already the company has received the backing and collaborative support from stakeholders including Belfast City Council, Belfast Harbour, Stena Line, Bombardier, Harland and Wolff, Queen’s University, Ulster University, Belfast Met, NIACE, Creative Composites and Catalyst Inc; and is the lead applicant on a UK Research and Innovation, Strength in Places funding call. “I am delighted to attend the launch of Artemis Technologies in Belfast Harbour and support their ambition to research and develop a zero-emissions shipbuilding facility. "It’s fantastic news that the company has chosen Belfast to build a 45 metre passenger vessel using a design based on the America's Cup catamaran yacht. To begin there will be 35 high-skilled jobs created but a clear ambition to expand rapidly. "Building on Belfast’s rich history of shipbuilding and combined with our current world-class expertise in technology and engineering, Artemis will collaborate with local universities and the aerospace sector to help kick-start a modern, shipbuilding resurgence in the city. "This is brilliant news for Belfast and another example of a world-class company choosing Northern Ireland as the best place to invest, innovate and grow a world-class workforce." “Belfast Harbour is delighted to support such a hi-tech project which complements our plans to further develop Belfast Harbour as an innovation hub. “The locating of Artemis’ centre in Northern Ireland is a great endorsement of the technological capability of the region. Artemis is developing products that have the potential to revolutionise sustainable maritime transportation. “The technologies required to support these developments correspond well with the capabilities and aspirations of our local supply chain. The ASV, and its precursor, will draw on aspects of aerospace, automotive, marine and electrical engineering, in addition to AI, control systems and data security. “There are a number of innovative advanced engineering firms in Northern Ireland already operating in these areas and they welcome the unique opportunity to work with Artemis. “I’d like to welcome Artemis Technologies to Belfast - its vision for green innovative growth will, I am certain, capture the imagination of all our citizens. I’m delighted to see further investment that brings jobs creation and a boost to the local economy. “Artemis is one of the success stories from the council’s City for Investment Service which provides a ‘soft landing’ for businesses to tap into council networks and get marketing, employability and skills support. 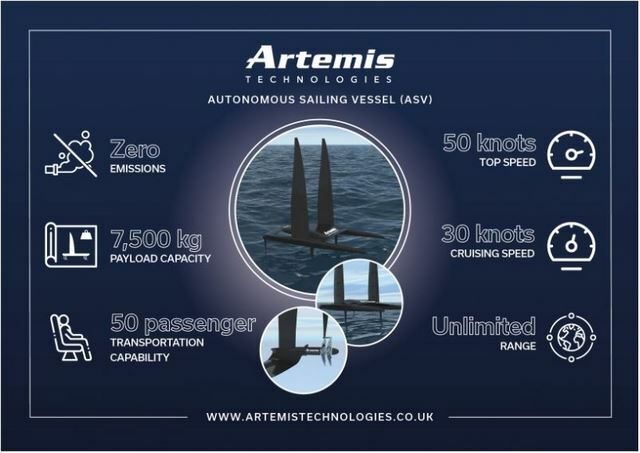 Artemis Technologies was founded in 2017 to utilise the innovative intellectual property developed from over a decade of high-performance yacht racing and America’s Cup competition by its sister company, Artemis Racing. 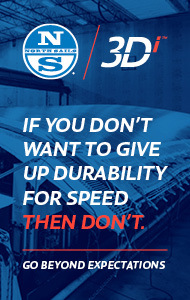 With experts from the fields of motor sport, aerospace and yacht design; Artemis Technologies utilises world class skills in simulation, lightweight structure engineering, electronics, hydraulics, aerodynamics, and hydrodynamics to deliver real innovation to its customers through unique products. 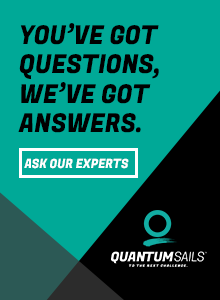 Hydrofoils, wing sails, and complicated control systems; the last decade of America’s Cup racing has produced technology with wide reaching commercial applications. The space age catamarans raced in Bermuda last year could sail at speeds of 50 knots (92.6 kilometres per hour) and had more in common with aeroplanes than traditional sailboats. 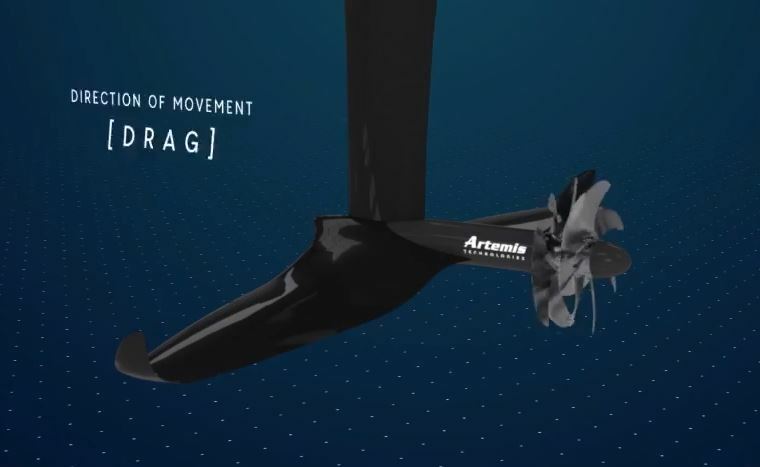 Having already established itself as the world’s leading high-performance maritime design and applied technologies company, Artemis Technologies has a bold mission: to help decarbonise the maritime industry. The company name, ‘Artemis’, comes from the ancient Greek goddess. She is a protector of nature. Outside Belfast, the company has a base in the University of Cambridge’s prestigious engineering department from where Artemis Technologies has spent the last year developing new green technologies maritime products. The ocean going ASV is a 45 metre, fully green-powered, catamaran with a top speed of nearly 50 knots and a cruising speed of 3 times the wind speed. The ASV project will act as a conduit to link numerous transformative technologies. 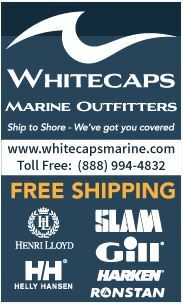 The first vessel will be capable of carrying 50 people. 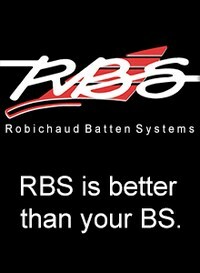 It will have an unlimited range, using F1 based energy recovery systems and zero carbon-based fuels. 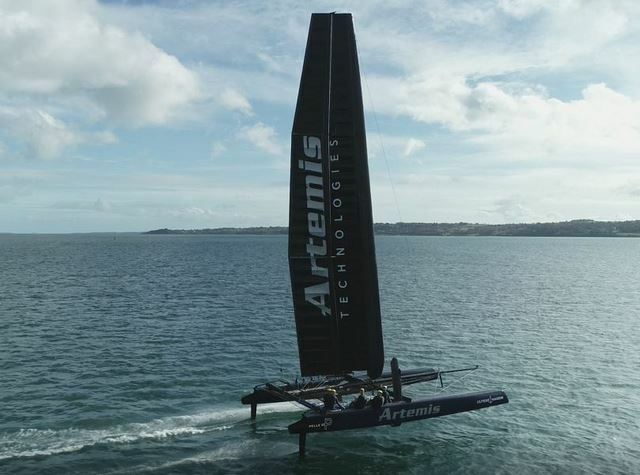 Artemis Technologies will use a modified version of its America’s Cup Artemis Racing AC45f 15metre foiling vessel as an initial ‘test mule’.